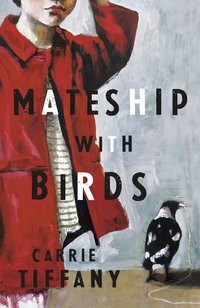 Last night the inaugural Stella Prize for women’s writing was awarded to Carrie Tiffany, for her novel Mateship With Birds. The prize awards $50,000 to recognize fantastic writing by Australian women. The name of the prize comes from one of the most celebrated Australian women writers of all time – Miles Franklin. As mentioned at last night’s ceremony, the prize gives Miles Franklin back her name – Franklin felt the need to publish under a man’s name in order for her writing to be successful. What a long way we’ve come, to now be recognizing women’s writing, and awarding such a bucket load of cash in order to give them the time and space they need to create their work. Carrie Tiffany graciously returned $10,000 of the prize money to the Stella Prize to be divided amongst the other shortlisted authors: Courtney Collins, Michelle de Kretser, Lisa Jacobson, Cate Kennedy, and Margo Lanagan. As she made the gesture, she talked about how money equals time for writers. Tiffany’s generosity and goodwill are a representation of the good feeling, positivity, and realistic nature of the whole Stella ethos. I missed the awards ceremony, but followed along on Twitter via the #stellaprize hashtag. The Stella team, as well as all the writers, readers, booksellers, festival people, and groupies in attendance did a fabulous job of making those of us at home feel like we were actually there. Quotes from speakers, selfies and group photos, virtual drinks with other proxy attendees… Even from the comfort of a tram and my desk at home, it was a fun night. Mateship with Birds‘ winning status has pushed it further up the reading pile, along with Zadie Smith’s NW, which is shortlisted for the UK’s “Women’s Prize for Fiction” (formerly the Orange Prize). In the middle of awards season as we are, there’s no shortage of things to read, but the hours in a day are sadly lacking.